Add 1 1/2 tsp of olive oil to a large skillet over medium heat. Add sliced onion and sugar, stirring to coat. Allow the onion to cool, stirring occasionally, until deep golden brown and caramelized. Remove onions to a plate and set aside. Add the remaining tbsp of olive oil to the skillet, set over medium high heat. Season the chicken breasts with salt and pepper. Transfer the chicken to the heated skillet and cook for 5 minutes, until golden-brown, then flip and cook the other side for a minute. Pour a can of chicken broth (~2 cups) into the skillet and cover for 7-10 minutes, until chicken is cooked through. Remove chicken from the broth and transfer to the plate with the onions. Add 1 tbsp olive oil to a Dutch oven (I just used a saucepan) over medium heat. Add garlic and cook til fragrant, about 30 seconds. Add rice to the pan, stirring to coat. Cook, stirring frequently, until the grains are translucent around the edges, about 3 minutes. Add the wine and cook, stirring constantly, until fully absorbed, 2-3 minutes. Stir in the leftover broth and 3 cups of chicken broth into the rice. Reduce the heat to medium-low, cover and simmer until almost all the liquid has been absorbed and the rice is al-dente, 16-19 minutes, stirring twice during cooking. Add 3/4 cup of hot broth mixture to the risotto and stir gently and constantly until the risotto becomes creamy, about 3 minutes. Remove the pot from the heat, cover, and let stand for 5 minutes. Meanwhile, shred the chicken into bite-sized pieces and mix with the caramelized onions. 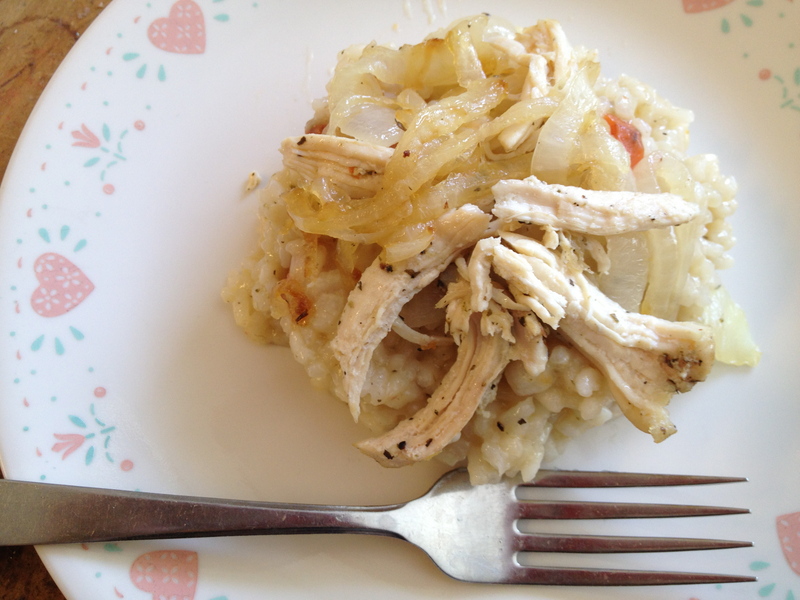 Top each serving of risotto with a generous amount of the chicken and onion mixture. Season with salt and pepper to taste.